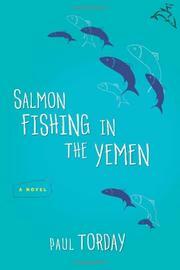 Sort of like a lesser Monty Python episode, this debut novel features British bureaucrats and biz types who collaborate with a starry-eyed sheikh to spur peace and profits by introducing salmon fishing in the Mideast desert. Middle-aged milquetoast Dr. Alfred Jones shudders at “the irrational, the unpredictable, and the unknown.” He’s a perfect patsy, then, for Torday to play with. The author embroils the star flunky of the National Centre for Fisheries Excellence in one seriously whacky scheme. E-mailing his dour, domineering spouse, Mary, about the project, Fred initially dismisses it as “scientifically nonsensical.” Political pressure, however, prompts his meeting with Sheikh Muhammad, who argues that the Arab-Israeli and Yemeni internecine conflicts just might evaporate if all warring parties embraced gentlemanly fishing. The beguiling billionaire wheedles Fred into submission; even more effectively, so does Harriet Chetwode-Talbot, dishy publicist for Fitzharris & Price, the posh consultants the Sheikh hired to strong-arm Parliament into realizing his impossible dream. Frosty financier Mary belittles Fred by reminding him that her salary’s twice his and constantly exacerbating his abandonment issues. Plus, her charms recall those of a Dickensian schoolmarm. Can’t blame Fred, then, for falling for Harriet, who might as well be a Bond Girl, and, even while romancing a cute upper-crust captain on tour in Iraq, not above leading Fred on. In short order, things get dizzyingly farcical, as al-Qaeda involvement is suspected, as the notoriously contentious English press assails the Prime Minister and as Fred loses his bearings and his heart. By the end, a House of Commons Foreign Affairs Select Committee is threatening to bring down a government, and nasty fates have befallen Sheik and Captain. DANNY, WHAT ARE YOU DOING?